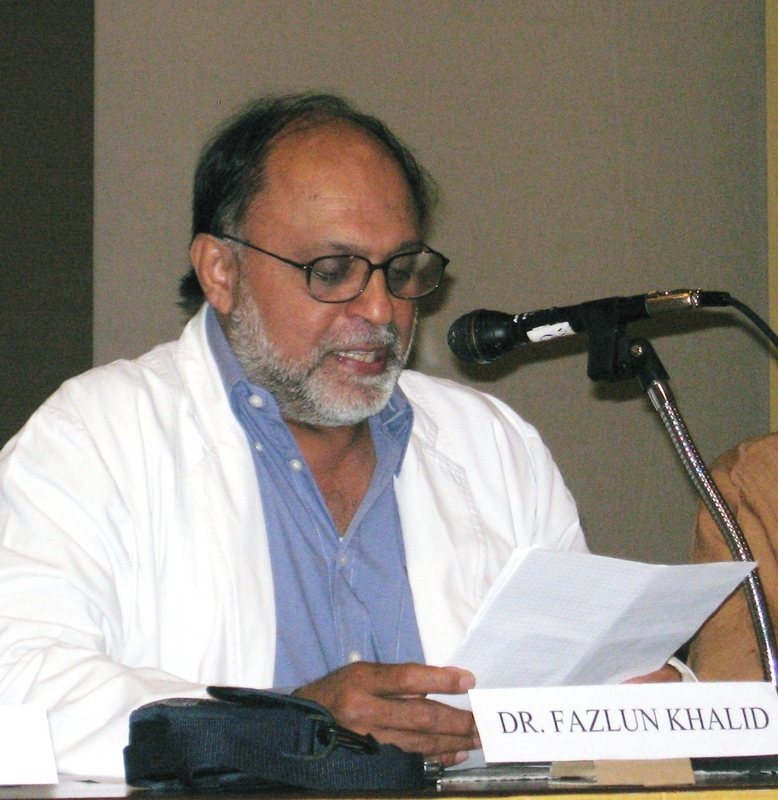 Dr. Fazlun Khalid is a pioneer of the Islamic environmental movement. The founder and director of The Islamic Foundation for Ecology & Environmental Sciences (IFEES), Dr. Khalid has led the way both as a scholar shedding light upon the environmental teachings of Islam, and as an adcovate raising environmental awareness among Muslims and developing methods of applying these teachings to small communities and everyday lives. When the Arc Angel Jibreel came to the Prophet in the cave at Hira and said, “Read in the name of your Lord and Cherisher who created. Created man out of a clot of congealed blood...” (96: 1, 2), Rasulullah responded by saying that he could not read but the angel insisted that he read. He was al-nabi al-ummi, the unlettered prophet, and to compound the situation he was not presented with a text he could read from. So what was he expected to read? It was Allah’s book of creation itself, “He is Allah – the Creator, the Evolver, the Bestower of Forms ...” (59: 24). What is the connection between the essence of Islam and the Islamic environmental message? The Qur’an is inherently environmental. It could be described as an environmental guide book and Muslims have lost this perspective in their teaching. Almost every page in the Qur’an has a reference to the natural world: the sky, the moon, the stars, trees, fruit and vegetation. Several chapters in the Qur’an are named after animals and insects: The Cow, Cattle, The Bee, The Ant and The Spider. “But to God belongs all things in the heavens and on earth. And he it is that encompasseth all things” (4: 126). Muslims appear to be more concerned about the ritualistic aspect of Islam, and there is nothing wrong with this, but they don’t seem to want to pay enough attention to the message of Creation. When the Arc Angel Jibreel came to the Prophet in the cave at Hira and said, “Read in the name of your Lord and Cherisher who created. Created man out of a clot of congealed blood...” (96: 1, 2), Rasulullah responded by saying that he could not read but the angel insisted that he read. He was al-nabi al-ummi, the unlettered prophet, and to compound the situation he was not presented with a text he could read from. So what was he expected to read? It was Allah’s book of creation itself, “He is Allah – the Creator, the Evolver, the Bestower of Forms ...” (59: 24). We get confirmation of this from another part of the Qur’an, “On the Earth are signs of assured faith…” (51: 20). The word sign (ayat) applies to the created world as much as it does to the verses in the Qur’an. So the book that Rasulullah was able to read was the book of Creation itself and this is why the Qur’an is replete with descriptions of the natural world and our place in it. There hasn’t been a lot of commentary within Islamic thought that explicitly addresses the environment; and as you yourself say, there hasn’t been an environmental fiqh. Why has this aspect of Islam been neglected? The Qur’an on waste – “… But waste not by excess; for God loveth not wasters” (6: 141). The Prophet discouraged any wasteful action amongst his companions as this hadith shows: When the messenger of Allah passed by Sa’d as he was performing his ablutions he said, “What it is this extravagance?” Sa’d asked, “Can there be any extravagance even in ablution?” The messenger of Allah replied, “Yes, even if you are on the bank of a flowing river”. The Qur’an emphasizes the value of trees and other vegetation, “… the herbs and the trees both alike bow down in adoration” (55: 6). The lesson that is driven home by the Prophet regarding this is contained in the following hadith: Those amongst you who plant a tree or sows seeds that ultimately benefits a bird, or a person or an animal, is regarded as having contributed a charitable gift. But this is not all. Although it is not codified as a fiqh of its own the Shariah reminds us of systems of natural resource management which Muslims have employed over the centuries. This now takes second place to what we like to think of as economic progress. For example the Hima and Harim are community based land management systems which Muslim environmentalists are now trying to reintroduce. We are working on this in collaboration with Indonesian ulema/NGOs who are calling this aspect of the Shariah Fiqh al Bi’ah (Jurisprudence on the environment). I have been working on themes from the Qur’an and have suggested that this be called Ilm ul Khalq (Knowledge of Creation) and have developed an international training programme based on this teaching. I agree that these teachings have been neglected and we have much to gain and nothing to lose by bringing the environmental lessons that Islam gives us to the forefront. This is the good news of Islam but we have no time to waste. This method is vertically integrated, that is, it is linked from the basic teaching to training to establishing facts on the ground. A good example of this is the project we pioneered in Zanzibar where we persuaded fisherman to refrain from dynamiting fish. (See www.ifees.org.uk under projects). It is as well to note that this issue is also new to the secular world in that it did not surface until Rachel Carson’s book, Silent Spring was published in 1962. She discovered through her field studies that artificial fertilizer destroyed the food chain. We are living in a consumer society which is in a sense unreal. It is built on a paradigm that is designed to destroy nature and the human race has been very good at it. Every country in the world wants to “develop” and even Turkey is now qualifying to be one of the fastest developing countries in the world. The natural inclination of people is to better their lot, to have a good life. And having a good life today is seen as being good consumers and not really recognizing that we are depriving future generations of a decent life. This is why the Islamic articulation of this issue is important. We have to change ourselves. Allah does not change the condition of the people unless people change themselves. That is on the individual level. But if we want to look at the macro situation, the international globalized world today is on a disaster course. But the tragedy is that the Muslims who have the answers, don’t know they have the answers, don’t want to find out what they are, and even if they do, wouldn’t know how to implement them. We need to deglobalize; ‘‘think global, act local’’. We know the global situation is dire from what is happening to climate change. The Qur’anic Revelation came down at a time when Mecca was a centre of intense trading activity, and the financial success enjoyed by the Quraysh had begun to create significant economic and social inequalities within the old tribal system. Rituals of idol worship were very much connected to the Quraysh’s mercantile practices, and this is supposed as a reason for their resistance to the Islamic message. Can any parallels be drawn between the Prophet’s time and our own? If we go to Mecca today we see tall buildings, McDonalds, Coca Cola, Dunkin Donuts and much of what we can see in New York or any other city in the world. These are our new idols – distractions from the real purpose of the House of Allah. The global system which we are all part of is based on Capitalism which is based on Riba in spite of the so called Islamic Banks. “Those who devour usury will not stand except as stands one whom the evil one by his touch hath driven to madness” (2: 275). The oil oozing out of the desert sands may bring great wealth but money as we know it today is created out of thin air. It is the Satan’s touch at the root of the environmental crisis. Environmental degradation is based on the money that we create and if we don’t deal with this problem we are not going to deal with the environment. However we all want to “progress” and greed will eventually lead us to the destruction of the planet. This issue regrettably is absent in the Muslim discourse. We have to demonstrate the possibility that there is a way out. In my view Islam has the best teaching to effect this change. The Qur’an says, “… then strive together (as in a race) towards all that is good wherever ye are …” (2: 148). That is compete with each other in doing good things. We need to pose this challenge to the rest of the world and in this competition there are no losers. If we win everybody wins; if others win we also win. This is a very positive message and we need to give this out. The secret lies in the Sunnah of the Prophet Muhammad (pbuh). He is the original Islamic environmentalist and it was not a conscious thing. Good behavior always leads to a sound environment. In my view Islam has the best teaching to effect this change. The Qur’an says, “… then strive together (as in a race) towards all that is good wherever ye are …” (2: 148). That is compete with each other in doing good things. We need to pose this challenge to the rest of the world and in this competition there are no losers. If we win everybody wins; if others win we also win... The secret lies in the Sunnah of the Prophet Muhammad (pbuh). He is the original Islamic environmentalist and it was not a conscious thing. Good behavior always leads to a sound environment. Did you always maintain the same environmental outlook? I’ve always loved nature. I was born in Sri Lanka. My father used to take me to the forests and we drenched ourselves under the water falls. As I was born in a country that was at the time colonial I grew up with a political outlook. But my political path was eventually defined for me by the environment. This has led me to examine the politics of finance and I realized that democracy as we know it today is based on banking and riba and this is haram in Islam. It is no longer a secret that money is created out of thin air. They are merely tokens of exchange which are then traded for tangible products. Money can be created to infinity but the natural world is finite. This equation is lopsided. Very intelligent people, even environmentalists, avoid this question and if seriously taken it will entail a life style change. But people don’t want to change. Can technology, such as renewable energies, change things? The current consumer model is made possible by our dependence on fossil fuel. The Paris climate change discussions to find a replacement for the Kyoto Protocol are due in December but I don’t think the agreement will work even if a consensus is reached as each individual nation state will pursue its own growth agenda. Renewable energy technology is fine but if we insist in continuing our consumer life styles it will be at the expense of depleting non renewable resources. In a sense we could be back where we started. One of the positive things coming from your message is that practicing environmental respect is a way of practicing Islam. I believe in the ‘small is beautiful’ philosophy and I would encourage the establishment of small communities where we function within the Sunnah as far as we are able. “Nor walk on the earth with insolence; for though canst not rend the earth asunder, nor reach the mountains in height.” (17: 37). This is about treading lightly on the earth and reducing our carbon footprint and not indulging in activities that will cause our natural surroundings to strike back at us. Sunan Ibn Majah, 2, 425. See http://ahadith.co.uk/searchresults.php?pto at aage=3&q=wudu+river&rows=10. Sahih Bukhari 40, 518. See http://ahadith.co.uk/searchresults.php?page=3&q=trees&rows=10. Please type '253' into this field.